If you teach Spanish to elementary students, you will love these books. Language Together publishes picture books specifically written to support language learning. Their elementary Spanish books teach high-frequency vocabulary with simple sentences and fun stories. In addition, the books come with a free Teacher’s Guide packed with activities to help you use the books easily and effectively. Learn more about these theme-based elementary Spanish books on the Language Together website. You can purchase Language Together books on Amazon or as ebooks on iTunes. 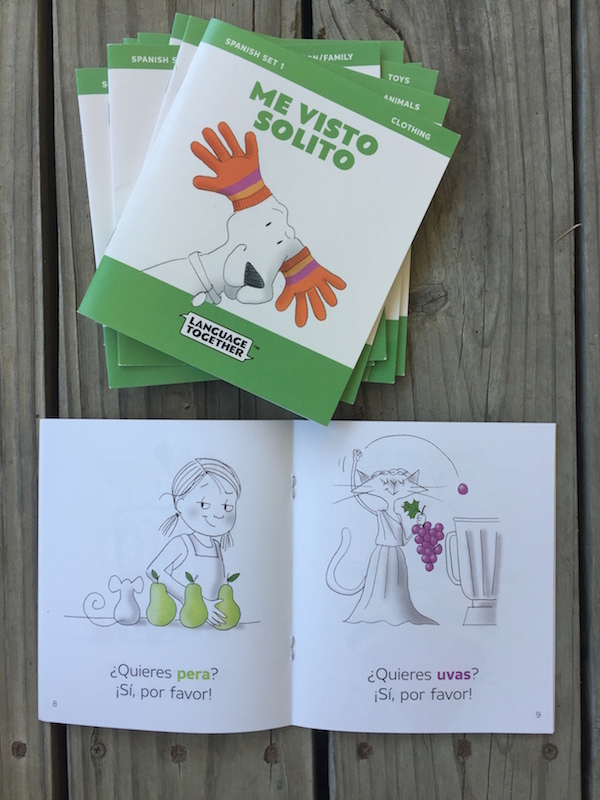 Be sure to visit our Spanish Books for Kids Resource Page for more reviews and activities. Also, see our list of resources with Spanish lesson plans and elementary Spanish curriculum reviews. Themes in Set 1 include animals, clothing, fruit, colors, body parts, numbers, shapes, food, family and toys. The vocabulary fits all elementary Spanish programs. Native speaker audio accompanies the elementary Spanish books. Listen online or scan the QR code in the cover to listen on your phone. Patterned sentences and repetition enhance learning. The books use high-frequency verbs. They are an ideal springboard for communicative activities with forms such as veo, es, mira, me gusta, me encanta, me pongo, quieres. The design includes a color text-to-picture link. The key word in the text is color-coded to match part of the illustration. Disclosure: I wrote the Teacher’s Guide for Language Together Set 1 and Set 2. Language Together’s free Teacher’s Guide makes teaching with the books easy and effective. The guide provides a set of fun vocabulary activities to use with all the books, as well as Book Guides with specific activities for each title. The Teacher’s Guide also indicates how the activities support the World Readiness Standards (ACTFL). The Teacher’s Guide includes 19 vocabulary and extension activities to use with all the elementary Spanish books. Grouped into receptive and productive, the activities and games are low-prep and designed to provide students repeated opportunities to hear and use the theme words. 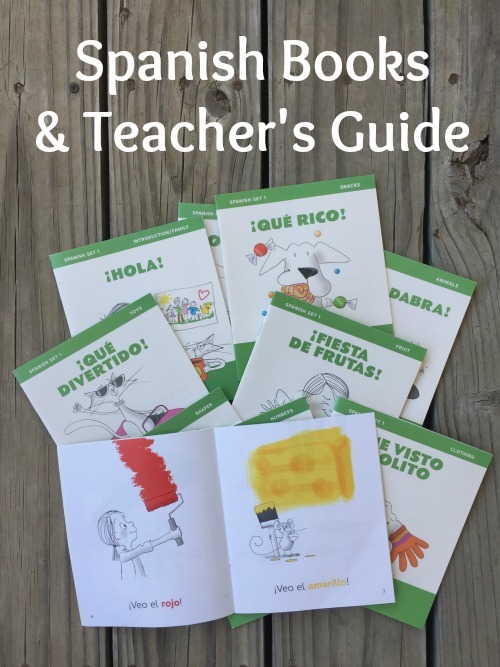 In addition to the 19 set-wide activities, the Book Guide for each of the elementary Spanish books provides activities tailored specifically to that title. It includes suggestions for enhancing your lesson using easy props related to the theme, as well as additional ideas for integrating the Useful Words and Phrases. Each of the Book Guides also includes a cultural connection. These suggestions connect the story content and vocabulary to the culture of Spanish-speaking countries. The activities require little preparation and raise awareness of geography, art, music and daily life in Latin America and Spain. Finally, the Book Guides connect each title to other themes, making it easy to re-enter vocabulary. For example, the book guide for the animal book reminds you to use the magician’s reactions to review emotions. The electronic versions of these elementary Spanish books are an excellent option for school or home. The stories have native speaker narration with highlighted text. This is an especially valuable feature for early readers, as they learn to associate the sounds of Spanish to the written word. The Language Together e-books are available on iTunes and you can try one free! Download ¡Abracadabra!, the animal vocabulary story, to share with your Spanish learners. See the other Language Together e-books in Spanish, as well as the French, English and Chinese versions. The elementary Spanish books from Language Together are a wonderful addition to any program. Designed to create comprehensible input, they introduce high-frequency vocabulary through fun stories. 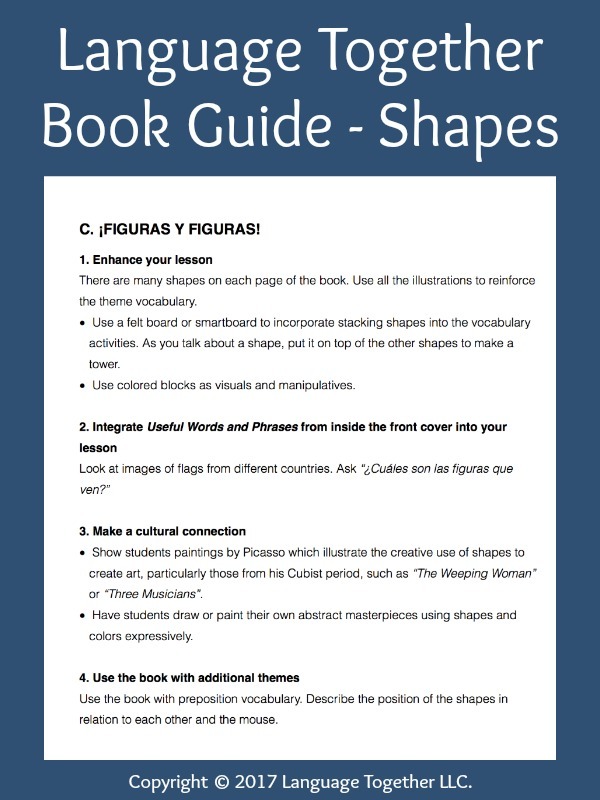 The complete Teacher’s Guide makes it easy to build on the books, reinforcing and expanding Spanish learning.